The market is segmented by Form (Staple and Filament), Blending (Wool, Cotton, and Other Blendings), Application (Apparel, Household Furnishing, Industrial, and Other Applications), and Geography. 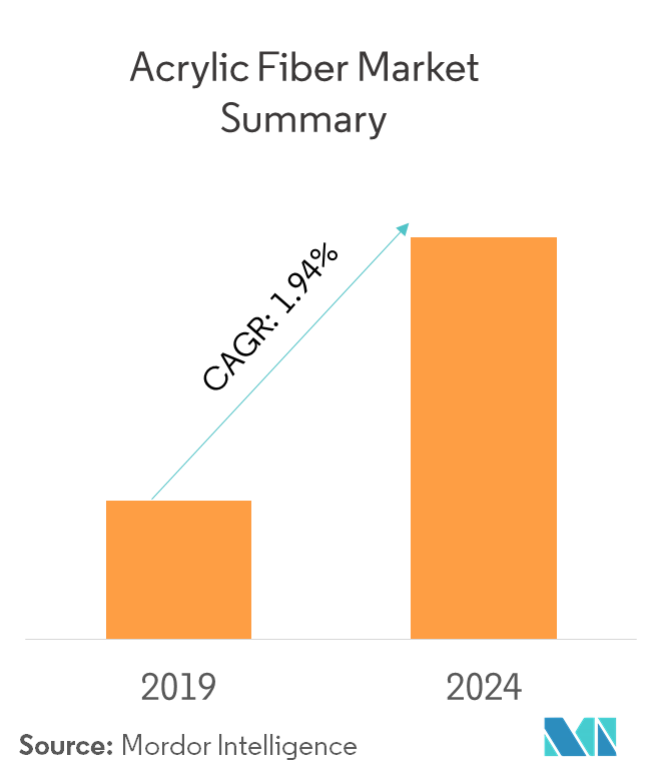 The market for acrylic fiber is expected to register a CAGR of 1.94% during the forecast period (2019-2024). The demand in blending applications and weak supply of substitutes, like wool and cotton, are the major factors driving the growth of the market studied. On the flipside, availability of cheaper substitutes, like polyester, is expected to hinder the market growth. By form, the filament segment accounted for the largest market share in 2018, and is expected to grow during the forecast period. Untapped potential in South Asia is likely to act as an opportunity in the future. 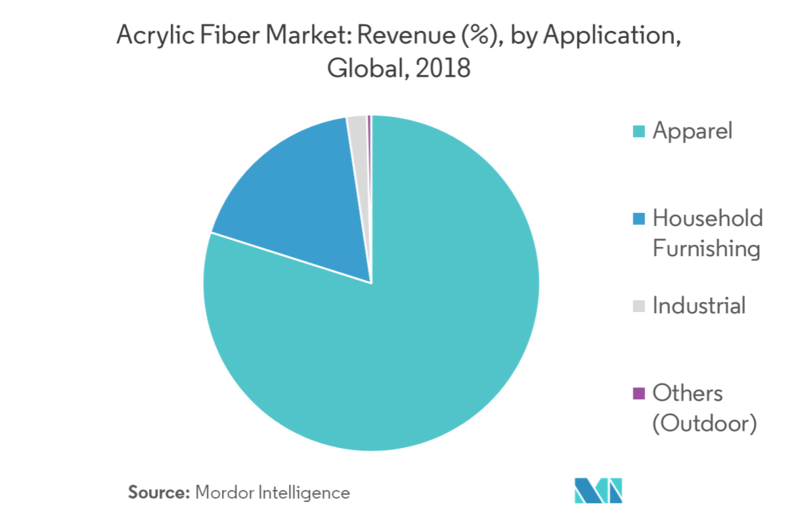 Asia-Pacific dominated the global acrylic fiber market in 2018, due to high demand from the ASEAN countries and India. Acrylic fibers, when blended with other materials, help enhance the physical and chemical characteristics of the end product. For example, cotton-blended yarns and fabrics provide superior comfort, elasticity, warmth, enhanced luster, high uniformity, and have a soft feel to them. Furthermore, the stretch from the acrylic makes the yarn soft and easier to work with. Cotton and acrylics are generally blended in the proportions of 75/25, 60/40, or 50/50. Wool is another material that is blended with acrylics from time to time, as the resultant end product is always lightweight, possesses good resilience and elasticity. Demand for blended fabrics is increasing steadily, owing to its economical nature, when compared to pure materials, along with the added factor of value addition provided by the various bending materials. 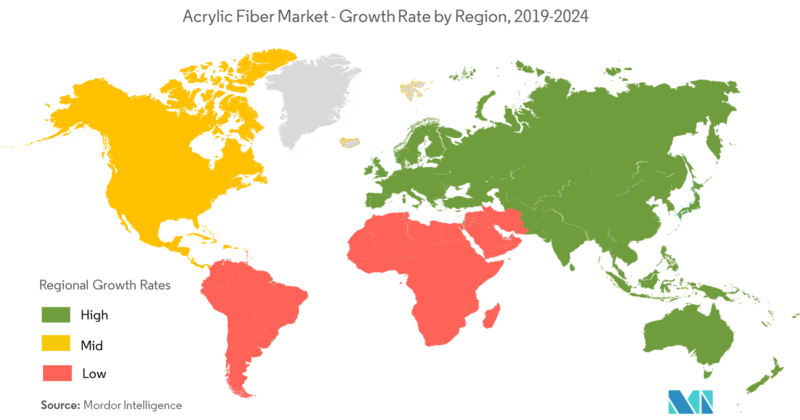 China, Turkey, and India are few of the countries that have acquired significant shares in the blended yarn segment. Turkey, which has one of the largest textile markets in the world, produces around 1 million metric ton of cotton yarn annually. In India, though the production of blended yarn declined for the first time, in 2017, in the past five years, the demand is still stable, which is expected to recover the production in the upcoming years. Such attributes are expected to drive the market for acrylic fibers in the blending application, throughout the forecast period. The Asia-Pacific region dominated the global market share in 2018. China is the largest producer of acrylic fibers across the world, accounting for a share of more than 30% of the global acrylic fiber production. Owing to the rising demand from domestic and international markets, primarily from ASEAN countries, Europe, the United States, and Japan, the textile industry in China is expanding at a healthy rate. This is one of the key factors boosting the demand for acrylic fibers in the region. The Indian textile industry is estimated to register a CAGR of 8.2% during the forecast period. The Government of India has announced to invest INR 690 crore (USD 106.58 million) for setting up 21 readymade garment manufacturing units, for the development and modernization of the Indian textile sector. The macro-economic condition of ASEAN countries is likely to project strong growth in the coming years. The region bounced back strongly in 2016, as the growth surpassed the past six-year’s record, owing to the fair boost in the economies of Malaysia, Singapore, and Vietnam in the last two quarters of 2016. The recent uptick in commodity prices has turned a favorable atmosphere for the regional exports. The textile and apparel industry is one of the major markets for acrylic fibers. The increasing investments in the Indonesian and Indian textile and apparel sectors are likely to boost the demand for acrylic fiber, in the manufacture of various apparels and household furnishing. 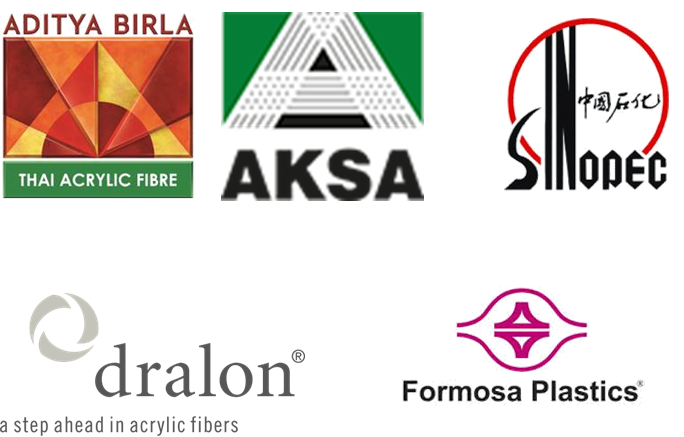 This, coupled with plans of the textile industries in these countries to make agreements with the European Union, is likely to have a positive impact on the demand for acrylic fiber. 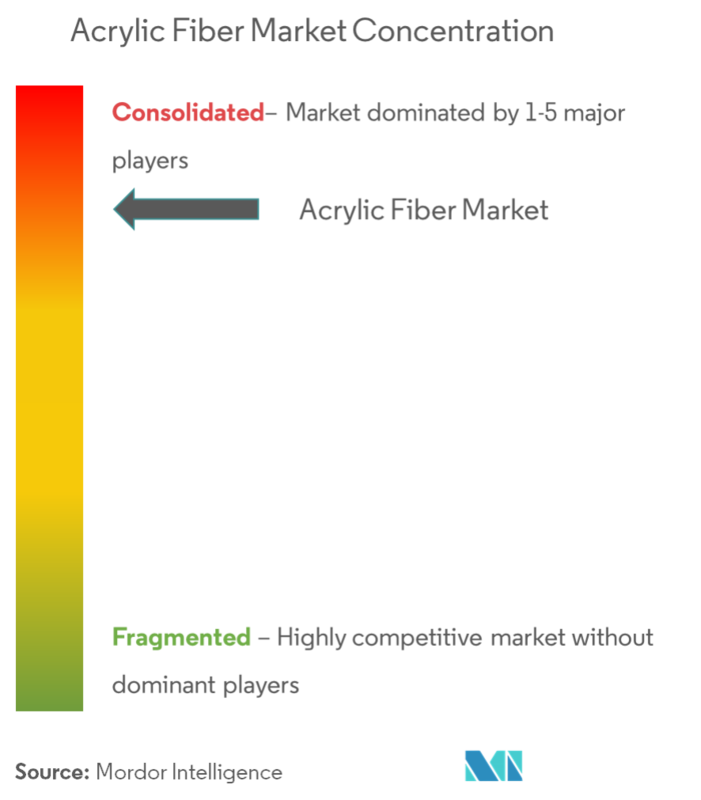 The acrylic fiber market is consolidated among the top five players, as they account for almost 50% of the market. Some of the major players of the market studied include Formosa Plastics, Toray, Aditya Birla, Dralon, and Aksa.